Have a question about Hemo-Rage Shot? What is it, what does it do, how and when to use or something else? Ask us. 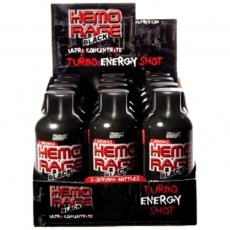 “Hemo-Rage Shots 12 x 118ml” is currently out of stock. Enter your details below and we will let you know when it's back in stock. May be way too strong for some individuals; start by taking only one serving (half a bottle) in a 24-hour period. Once you’ve tested your tolerance you may dare to consume a full bottle. NEVER EXCEED ONE FULL BOTTLE IN A 24-HOUR PERIOD.